Welcome, friends. 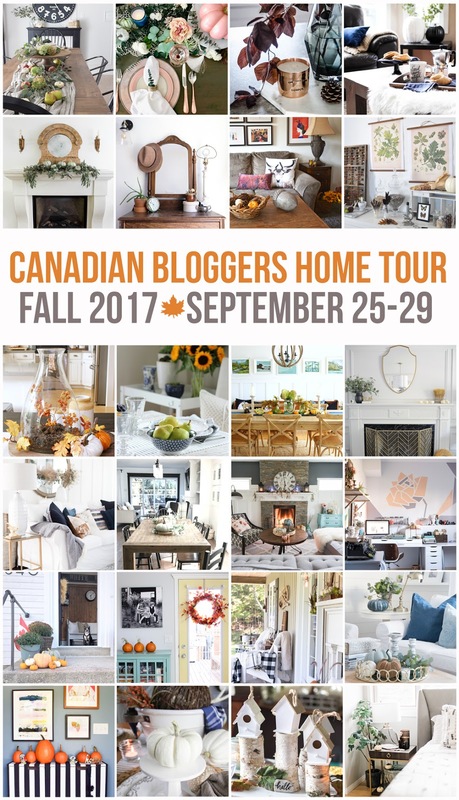 If you're joining here from the Canadian Bloggers Fall Home Tour hosted by Christina of The DIY Mommy and Shannon of AKA Design, come on in. 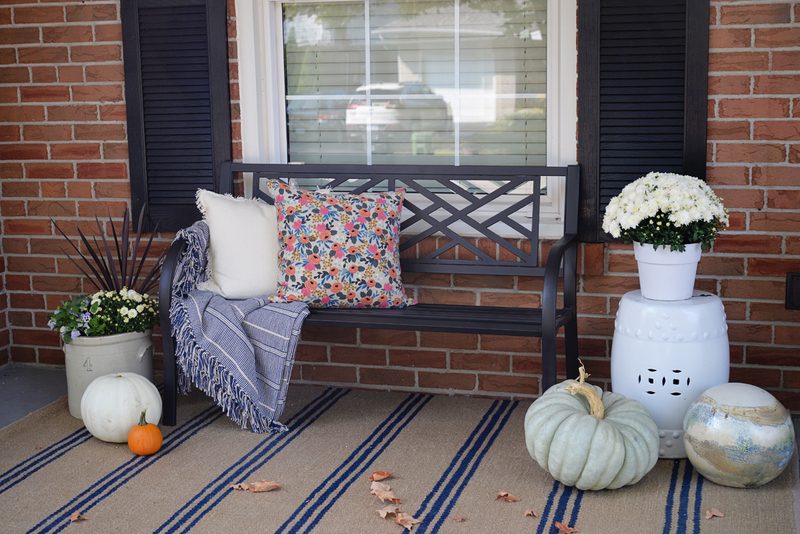 I've decorated my living room and porch for the season and I'd love to show you around. 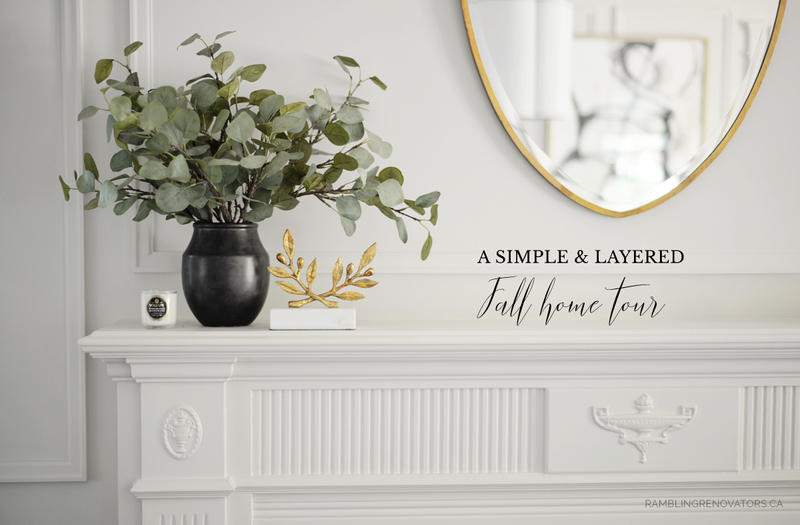 When it comes to fall decorating, my mantra is simple and layered. 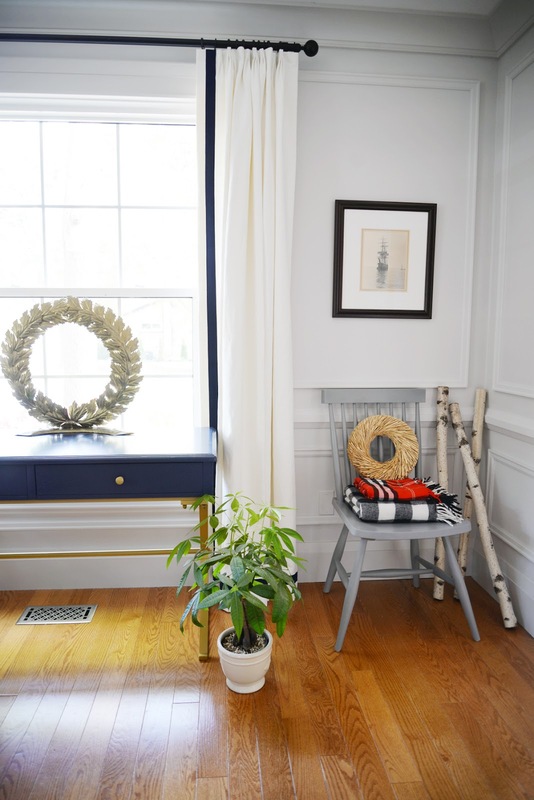 This time of year feels busy for all of us - back to school routines, winding down from the summer, raking leaves - that decor is one thing I don't want to have to worry about. 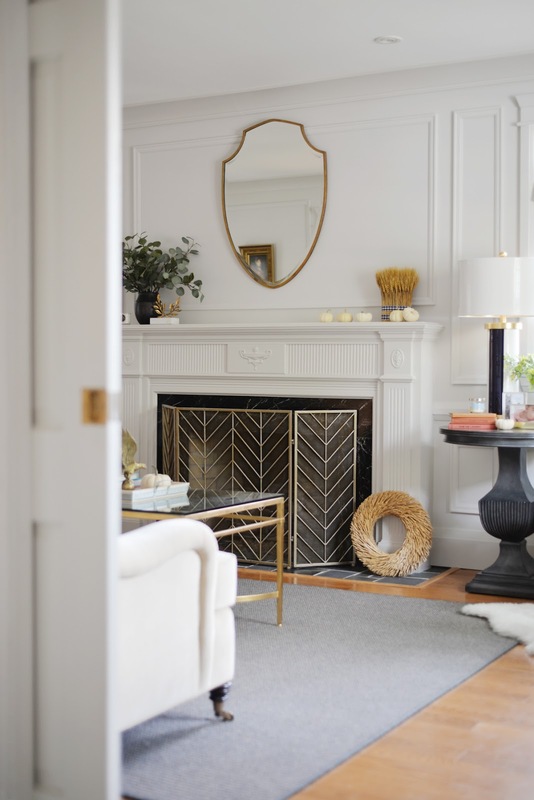 Luckily, you don't need to do anything too extravagant to get that cozy fall feeling. This chair is one of the most popular seats in our house. 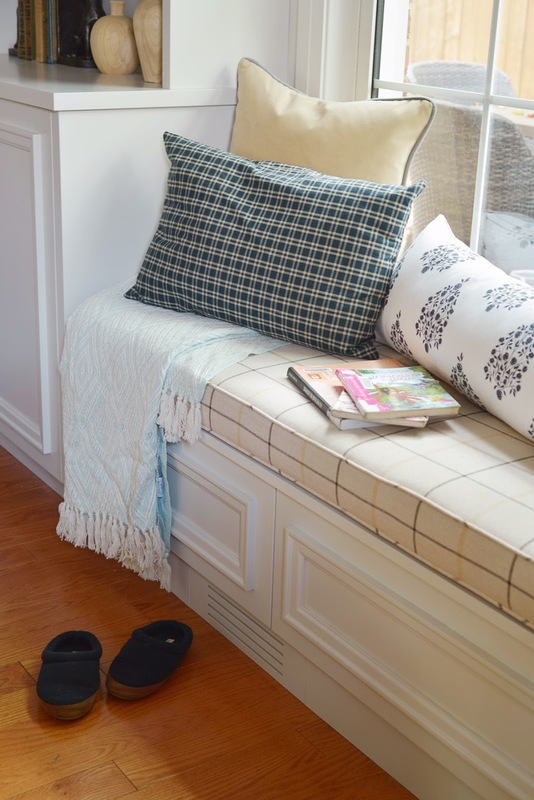 You'll likely find me sitting here on a weekend morning with a cup of coffee, listening to an acoustic playlist on the Google Home (seriously, best invention ever). 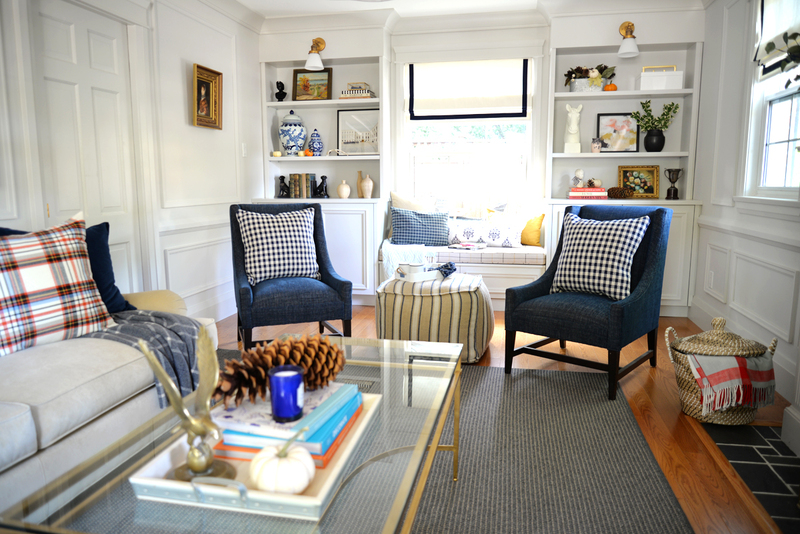 To make it the ultimate in comfort, I've added a throw and put a faux fur rug underfoot. 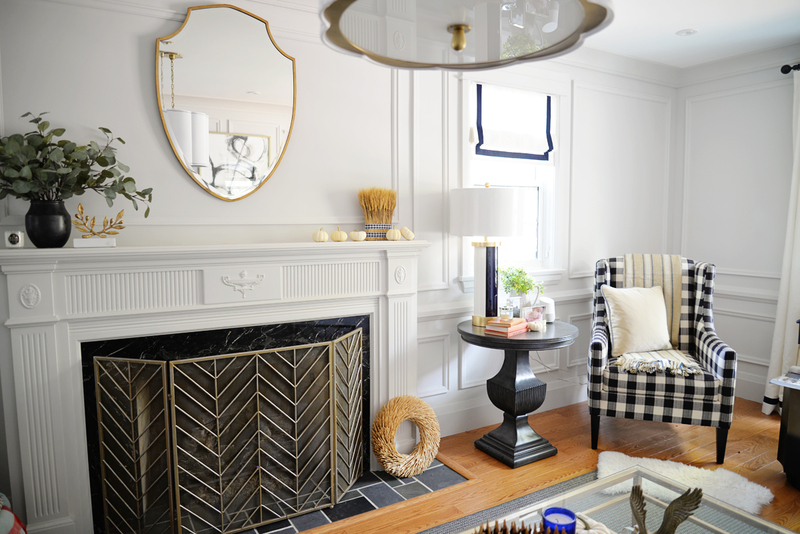 Adding in warm-hued accessories is a simple and easy update. 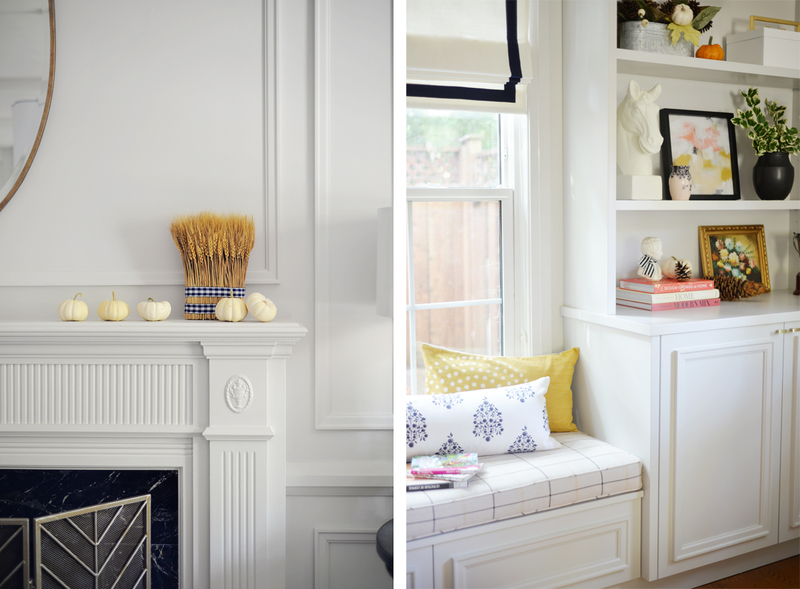 Books and pumpkins, throws and natural wreaths bring texture and colour into this neutral room. 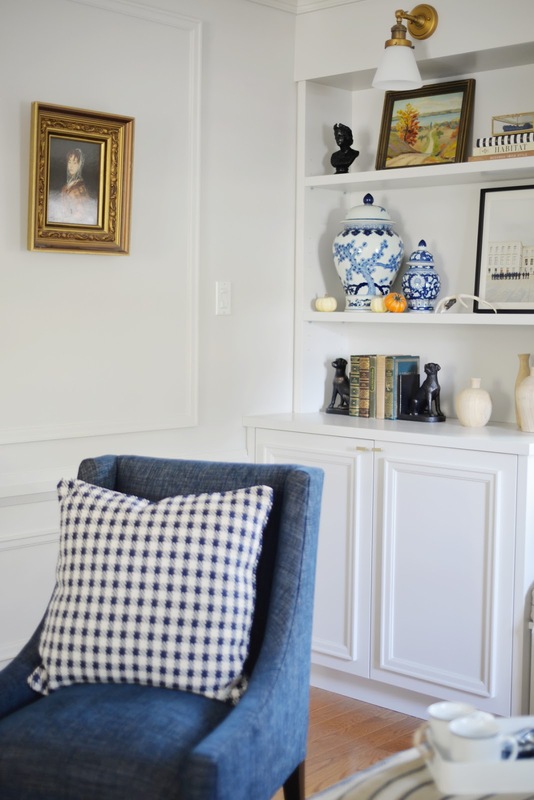 Other quick changes, like switching out art and trading the model ship we had on the desk for a brass wreath, can make the room feel refreshed without a lot of effort. 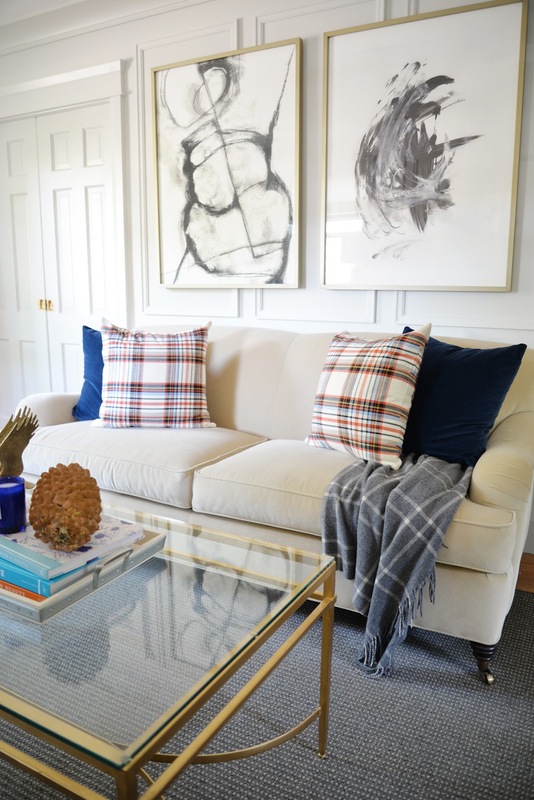 Plaid pillows and throws, you can never have enough. 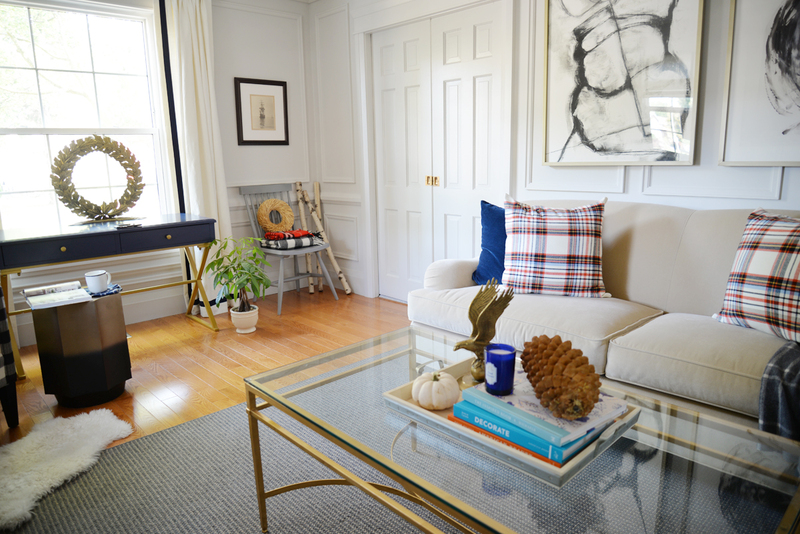 My fall look is all about layering and bringing in extra accents to make the room feel full and comfortable. I love the bold colours on these pillows. The velvet and cashmere textures are perfect for cozy nights on the sofa. The fall makes me think of enjoying fires and late night drinks and conversation in this room. A simple tilt of the chairs and using the striped pouf as a table lends a more casual air which is right for entertaining. 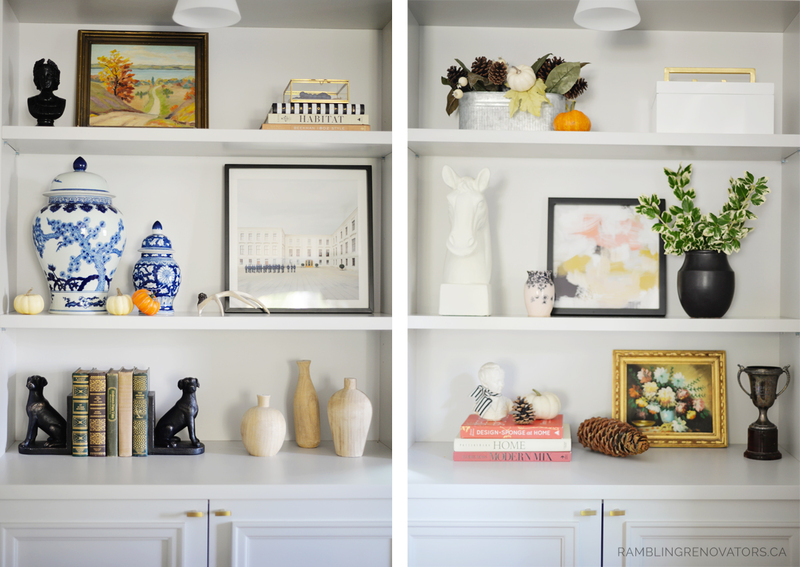 After we renovated this room in the spring for the One Room Challenge, one thing I looked forward to was changing out these shelves each season. Pops of orange, pinecones, and baby boos are all I need to create a moodier display. But the mantle might be the area I like decorating most of all. My tastes have changed over the years and lately I'm craving a look that is crisp and uncluttered. Faux eucalyptus (from Ikea!) and dried wheat keep things easy and low maintenance. 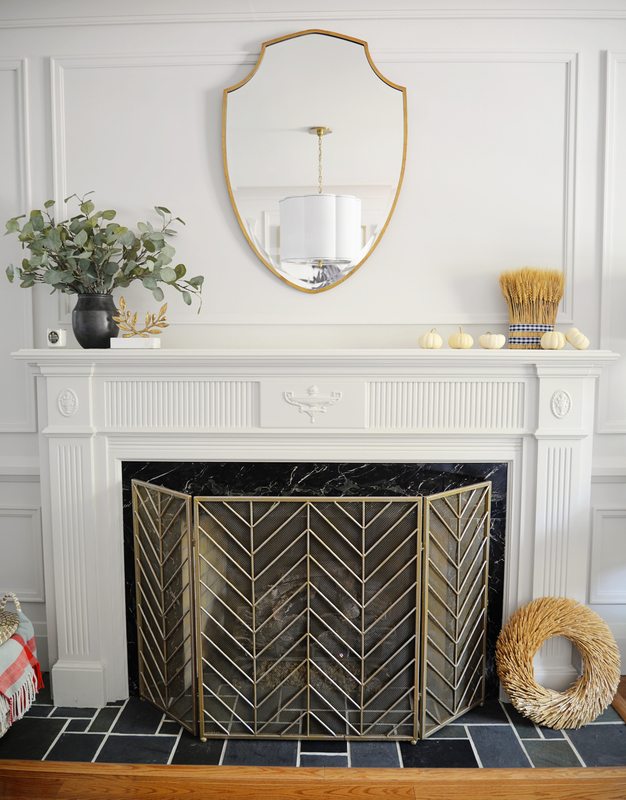 I can't wait to outfit this mantle with garlands and lights for the holidays but for now, a spare look seems just right. 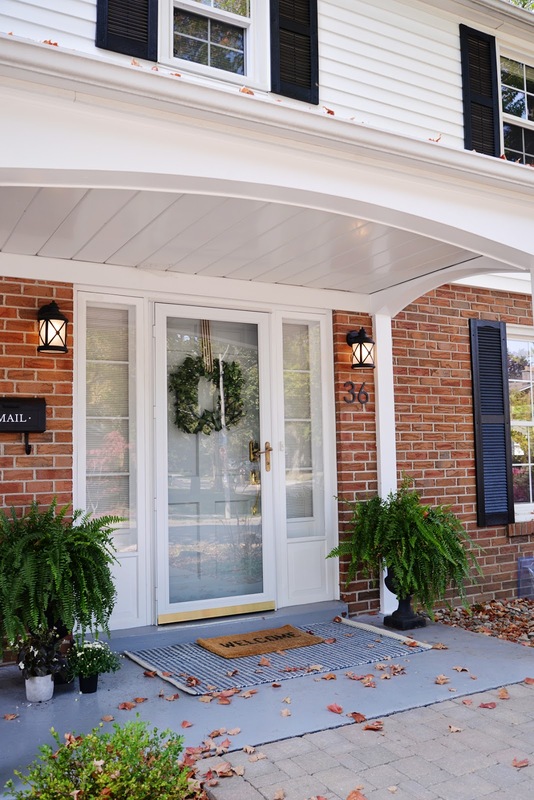 We recently finished up some major exterior changes so I wanted to have the porch looking warm and welcoming. Fall flowers and pumpkins and a colourful pillow are enough to make me want to sit outside with a cup of cider. And Mother Nature has done her bit, covering our porch with crimson leaves. I hope you've enjoyed the tour. 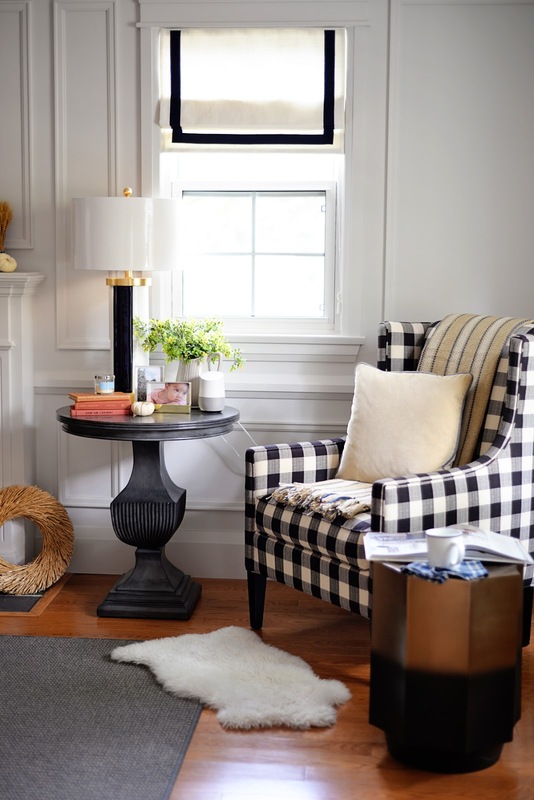 Now head over to these blogs to see even more fall inspiration.